A History Detectives fan from Maine has inherited a most unusual document. The yellow, three-page record dates 1791 and reads, “Act of Incorporation of the Universal Friends.” This document has been handed down through the family for over two centuries. The Universal Friends were an early, controversial religious group with a woman leader named Jemima Wilkinson, the first religion founded by an American born woman. Our contributor wants to know what this document means. And was Jemima Wilkinson behind it? 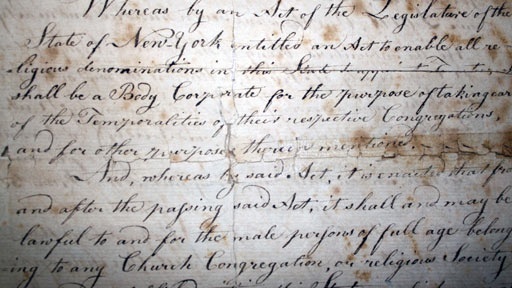 History Detectives unravels the mysteries of this short-lived religious community and visits a 200-year-old graveyard where there is a striking connection to the owner of this document. Read the original Universal Friends Society Act of Incorporation document. Related Investigation Mystery Crystal Cross Where did this mysterious religious relic discovered in an old Spanish mission originally come from? Also with Gwen Wright Cesar Chavez Banner What role did this banner play in one of the most famous civil rights campaigns in U.S. history? Also in Revolution: 1754-1820 George Washington Miniature Did the artist paint this portrait from life, and what is its surprising connection to the abolitionist White Matlack? Also in Season 8 Lost City of Gold What can these carved letters reveal about the first explorers to visit the American Southwest?